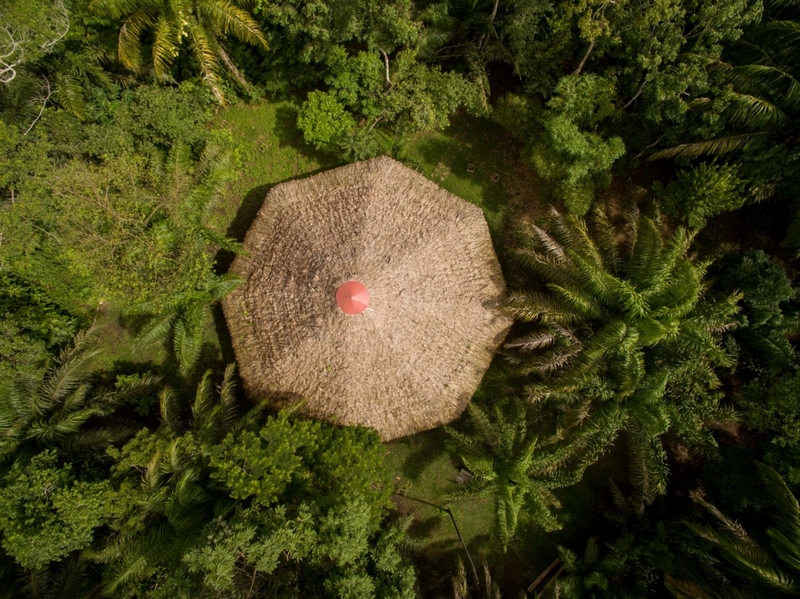 Pisatahua was carefully designed to maximize the comfort of our guests, while minimizing our impact on the environment. 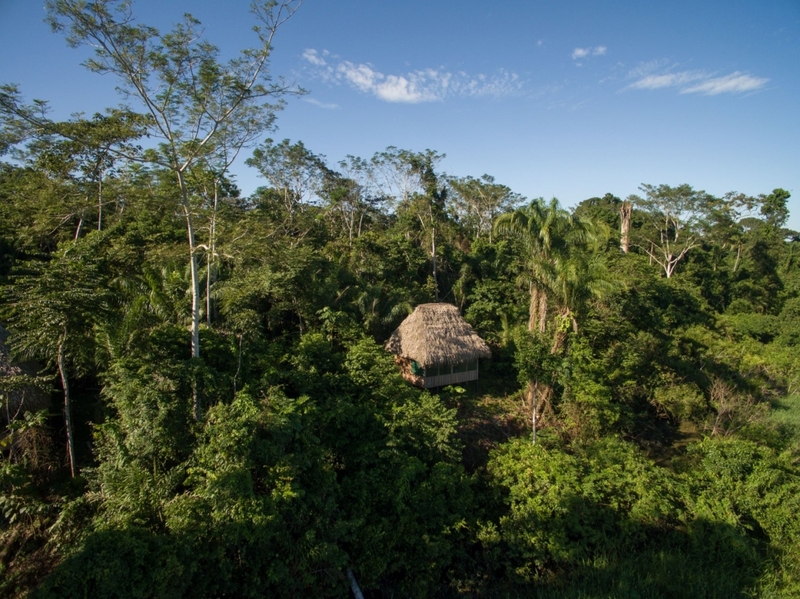 All cabins were constructed with sustainably harvested secondary-growth rainforest materials. We went to great lengths to minimize the removal of any vegetation and utilize energy efficient technologies. 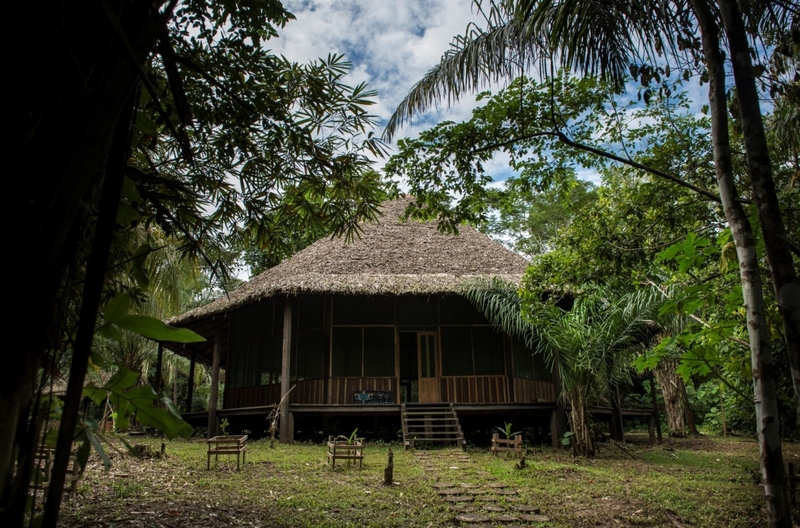 For more information on our sustainable living measures, please refer to our Ecolodge Sustainability page. All cabins were designed through the adaptation of local construction techniques to meet the needs of our guests. We worked hard to ensure they are comfortable, clean and safe. 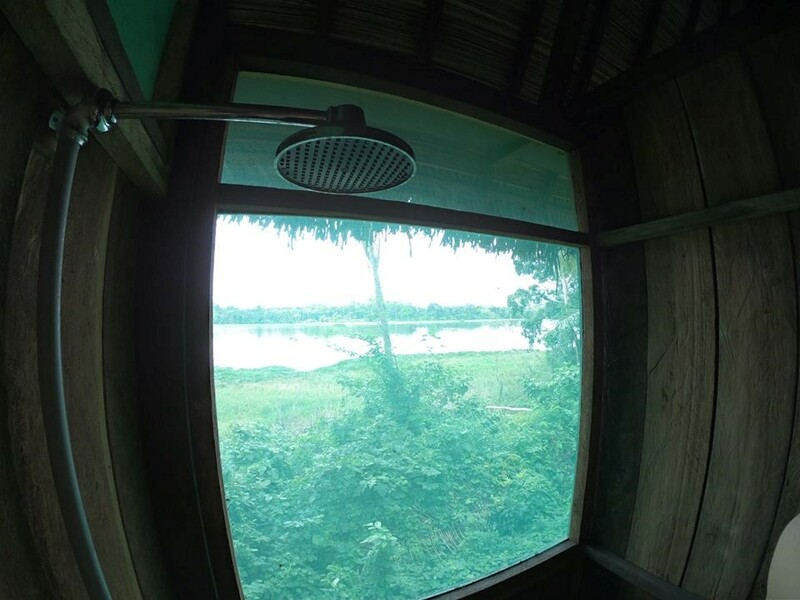 Cabins are secluded from their neighbors and extremely spacious (30 square meters/ 323 square feet). 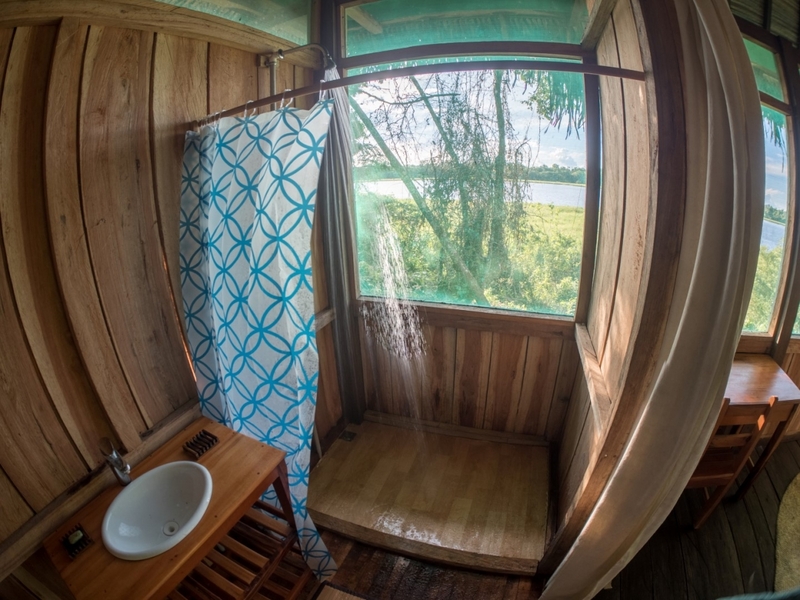 They are fully furnished with with running water, private bathrooms, washbasins and showers. 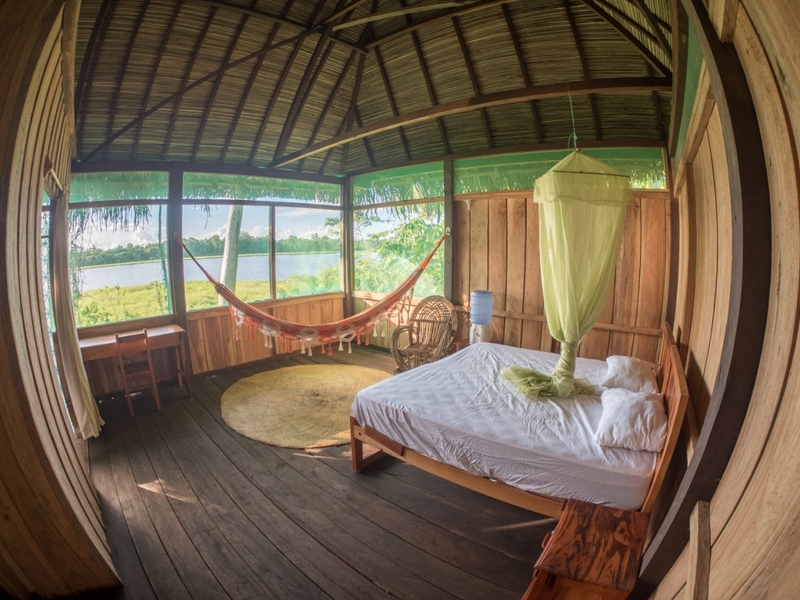 Cabins have high thatched-roofs and sit one meter above the jungle floor. 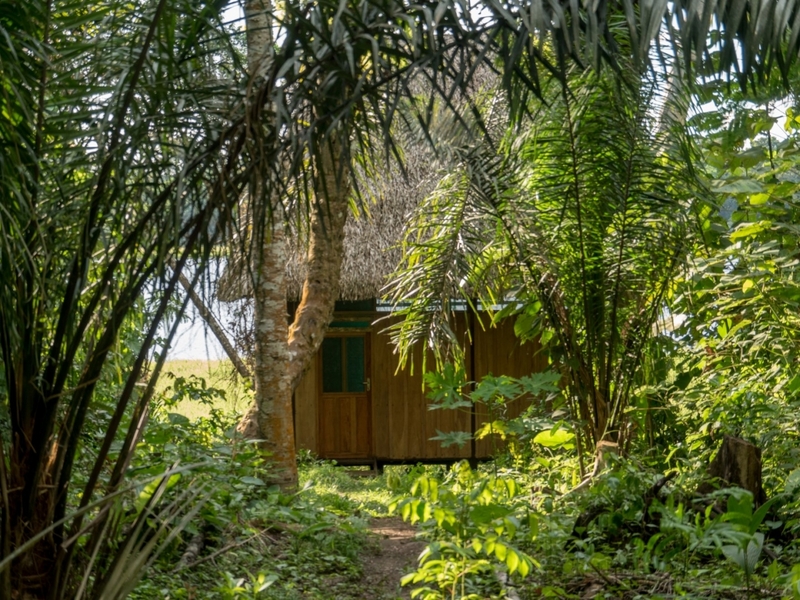 Each cabin room comes equipped with 2 twin/or 1 super-king bed, shelving, solar-powered lighting, night-stands, an indoor hammock, a writing desk, chairs, and fresh drinking water. We also provide fresh linens, towels and can arrange for laundry service. 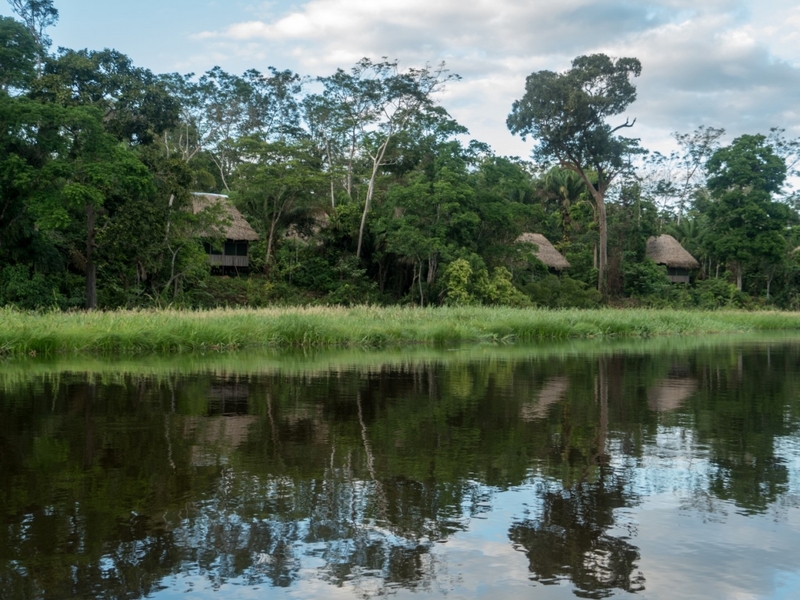 All cabins are situated facing the lake with enormous windows to maximize ventilation and views of the Aquicuana Reserve. 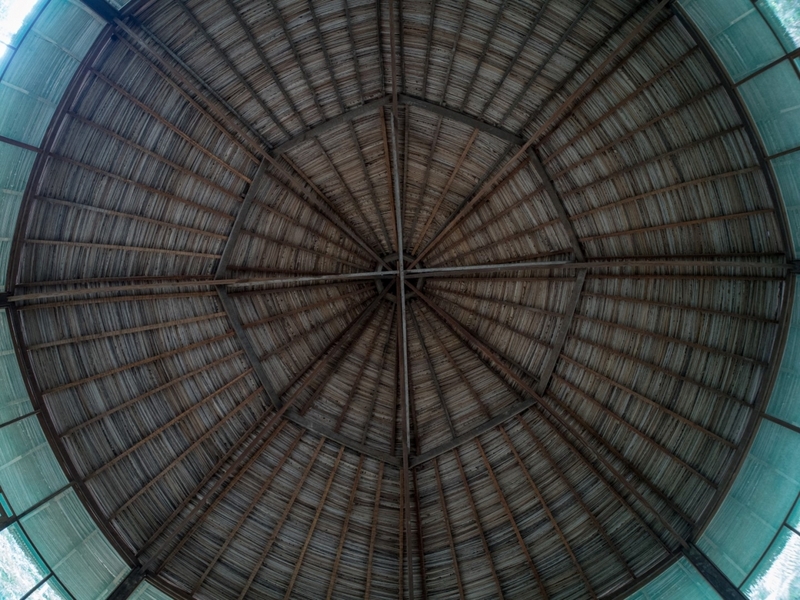 The Maloka is a large octagonal-shaped structure with a domed-shaped thatched roof made from palm leaves. Its spacious layout is entirely open with a 360 degree panoramic view. 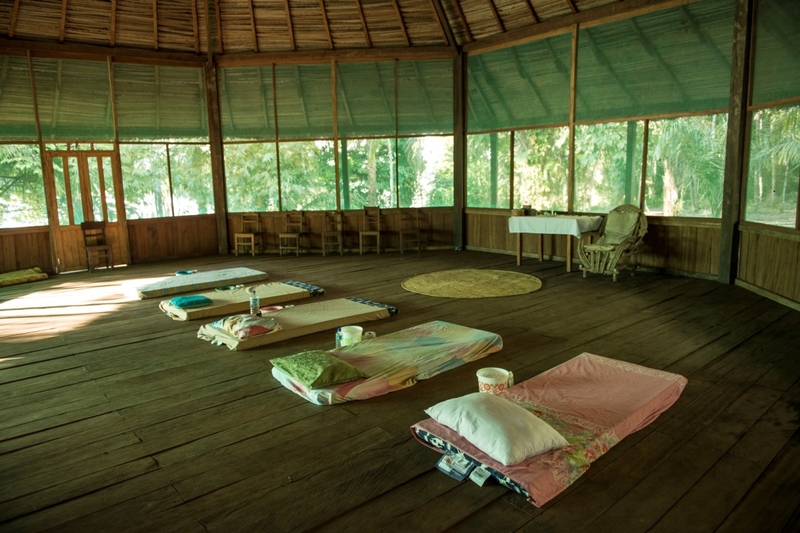 The Maloka is the largest building and ceremonial center of the retreat center. 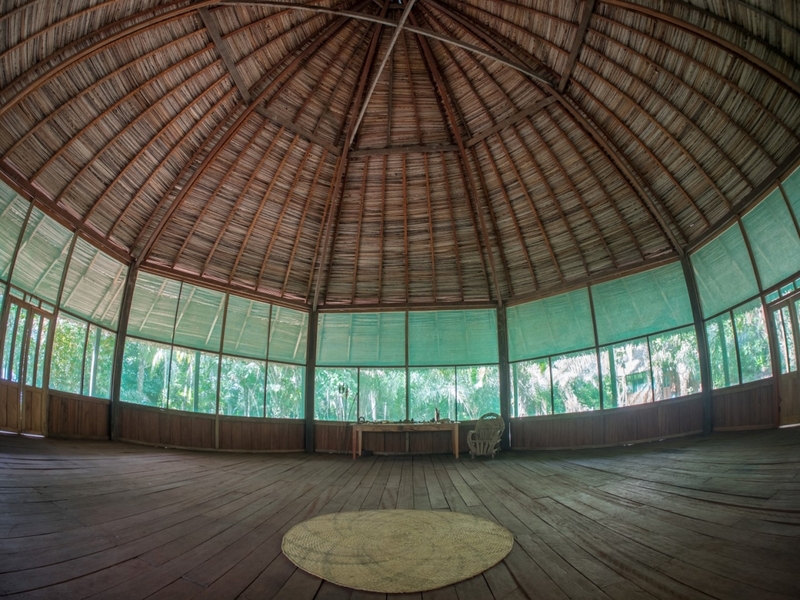 All ceremonies take place in the maloka and it also serves as a space for group-discussions, meditation, yoga and Tai Chi instruction. The Maloka is connected via a raised path to our dock and cabin on the Aquicuana Lake. Guests are always welcome to respectfully use this space however they choose. 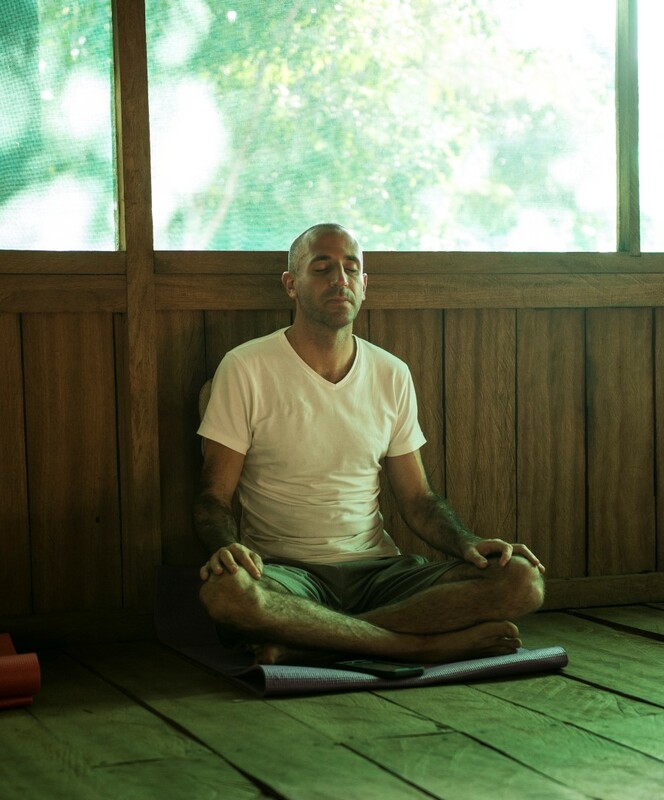 The Maloka is equipped with mattresses, pillows, blankets, buckets, yoga mats and hand towels. Additionally, there is a large altar with numerous items of spiritual power. Our public bathrooms are located 10 meters outside the maloka. The bathrooms are connected via a raised walkway to allow for easy and safe access.